That’s a lot of apostrophes, lol… but it just couldn’t be helped today… though, if you ask me, I’m not sure I’ll be able to provide you with a proper answer. I think that’s ’cause I’ve been sick this week with the punies. I’m feeling a tad loopy, lol. What’s the beginning of Spring if it’s not full of the cold and flu bugs trying to get hold of you? Well…they definitely succeeded in getting hold of us in the Dailey house. First my hubby brought something from his work and then I quickly followed suit. My youngest daughter now has them, and I hope that by some miracle my eldest will be able to escape. Yeah…probably not. But a mom can hope, right? I just wanted to pop in and let you know that even though I haven’t been posting much lately, it doesn’t mean that I haven’t been working up a storm over here, looming away on brand-spanking-new projects that have been earmarked for the upcoming book. Naturally, I can’t really spill the beans before it’s time, so I’ll have to keep them kind of secret for now. But I CAN inform you of the progress of these projects! 😉 I can let you know that I’ve had this one particular item in my sketch pad for well over a year and have only now had the opportunity to dive into it and make it a reality. I think part of the reason is that I was a little daunted by it. I wasn’t sure if the project would actually work out the way I had envisioned and so kept rolling it around in my noggin’ and not on my looms, lol. But, I’m very happy to tell you that I have completed one and a half of the pair and it is actually working as planned!!! Whew! …and it is cute, indeed! Can’t wait to show you all! The second item I have been working on is about 2/3rds complete and is just waiting for the times when I feel like putting the others aside and continue with it’s progress. I’m really liking this way I’m working on things right now. I have these projects all going at once and I just pick up whichever one suits me at the moment…or whichever one will travel easily, if I’m on the go. I think that this process will be most successful if I limit it to three going at a time, so that I don’t end up with too many things to focus on and not enough progress on anything to make it worthwhile…we don’t want any UFO’s gumming up the works, right? Well… now that you know a little bit about what I’ve been up to in the loomy category, I’d like to share a little special offer with you that I received in the mail. Raise your hands if you enjoy a little coffee and a sweet! How about Starbucks and a Sweet??? That just makes it even more mouth watering, right? Well… on the morning of March 23rd, until 10:30 am Starbucks is going to throw in any pastry with your coffee purchase for FREE! 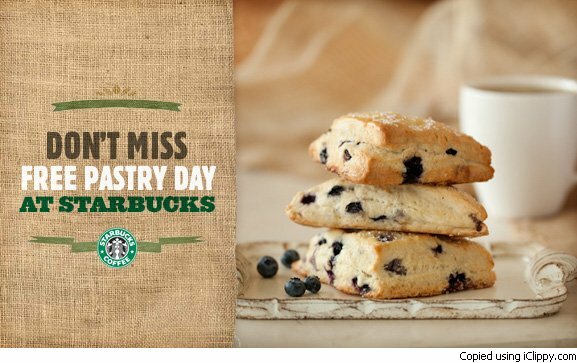 I’m going to be waiting in line for this one, believe me…I love a good scone or muffin with my peppermint mocha or black tea latte, lol! This entry was posted in Book Progress, Just Because, Loom Knitting. Bookmark the permalink. Thanks for updating us, Bethany! Sorry your on the puny side. Hope you are better real soon! As for Starbucks, I’m a one shot does it all person – Light Mocha Frappuccino with whipped cream.